August 9, 2016 - The Big Day: Colon Operation. Jane and I arrived at the Methodist Hospital in St. Louis Park around 6:30 am. and I thought to myself is this really happening? You never think something like this would ever happen to you. It’s always the other person, but not you. 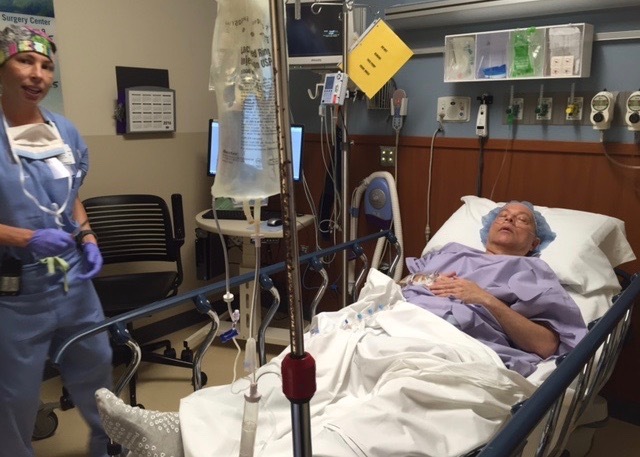 Here I was about to have surgery for stage 3 colon cancer. My sister Deanna Miller met us at the hospital because she wanted to be with Jane during and after the operation. We checked in and waited. Within ten minutes someone came out and escorted me to a room where they prepare you For surgery. I was met by a nurse (I wish I could remember her name) who began getting me ready for what was about to happen. It still felt like I was dreaming that this wasn’t really happening. It was so surreal. The next thing I knew I was laying on a bed in a hospital gown and the nurse was asking me questions and telling about the procedure and what is going to happen next. At some point in the conversation I shared with the nurse a little about my story and the goodness of God and His faithfulness. It was at that moment I knew she was a Christian. Her face lit up like a shining light. She then shared a little of her story and the miracles of God. I asked her to pray for me. Which she did. After the prayer we both began to weep. It was an experience I will never forget. What was amazing about the experience that day I was at total peace and I felt Gods presence everywhere. I wasn’t full of anxiety, scared or anything like that. Jane and I were all prayed up by the time we arrived at the hospital. By this time the sedative had taken its effect and I was so relaxed laying waiting for Jane. Within minutes she arrived and sat down next to the bed and began to talk and pray. I asked her to take some pictures which she reluctantly did and within 15 minutes the team came to get me. By this time I was going with the flow. The surgery was to take approximately 3 1/2 hours to 4. Throughout this entire journey God has shown his faithfulness in ways I could never imagine. He has brought the right people at exactly the right time to encourage us during this new season of our life. You are about to witness God’s never ending love and compassion for me, my family and others throughout His story which keeps on being written.